If you don’t like the classic beans porridge, Peeled Beans Porridge is one way to keep beans in your family menu. It is great for kids and they love it. This recipe tastes so much like breadfruit porridge so if you are craving breadfruit and you can’t buy it where you live, go for Peeled Beans Porridge. 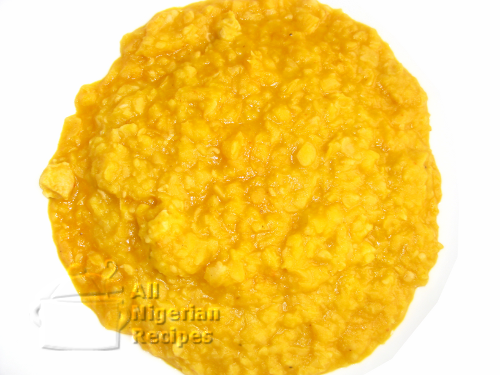 All you need to do is add dry fish to the recipe and you are good to go. What more, this recipe will not make you feel bloated because the beans coat is removed. If you want to prepare this recipe for a baby that is less than 1 year old, please do not add salt. If you don’t feel comfortable adding pepper to your baby’s food, please skip this ingredient. Chop the onions, grind the crayfish and pepper. Cut the chicken breast into small pieces. If you are cooking the breadfruit-taste-alike version, soak the dry fish and separate into small pieces. Put the peeled beans in a pot, pour water up to the same level as the beans and start cooking. If using the dry fish, add it at this time. Cook till tender adding more water from time to time, if necessary. Always keep the water at the same level as the beans so that when the beans is done, you will not have too much water in the porridge. When the beans is soft, add the onions, crayfish, pepper and seasoning, stir well. Add palm oil and cook till the oil changes to deep yellow. Stir very well, add salt to taste and it is ready to be served. Bear in mind that the porridge may look watery at this time but it gets thicker when it has cooled down. If you prepared it for your baby, place single feed portions in a flat plate, wrap with a plastic film and freeze. Once frozen, remove the now solidified portions and place in a ziploc bag or container and put back in the freezer. So when you want to feed your baby, all you need to do is bring one portion out and warm it up in the microwave.